Body Wraps are the latest hype and craze as they are said to be the quickest and the most effective way to get rid of cellulite, loose inches, tighten skin, nourish and detox your body. A number of spas have come up with these 'wrap sessions' at an amount as high as $300 for a 45 minutes session, promising you to drop at least one dress size. So what is a wrap? How is it done? Will it really get rid of the stubborn cellulite? Is it safe and chemical free? Here's answering all your questions and a few great recipes for a DIY body wrap. Body Wraps have been designed by fitness buffs for the sole purpose of tightening skin and loosing cellulite. The problem areas of your body, the tummy, thighs, neck and arms, in fact any area, is wrapped in a special concoction, for about 45 minutes to one hour, giving you the results of a visibly toned area. A mixture is applied onto your body and wrapped in plastic wrap or soaked bandages, which makes your body sweat, and the nutrients from the home-made mixture help in detoxing your body. Wraps make you sweat, thus aiding in weight loss, toxin release and loss in inches. They also aid in skin regeneration and blood circulation. Results are said to be similar as those of a sauna or a steam room, however, the drop in inches is much more as compared to the latter as the fat and cellulite is permeated. 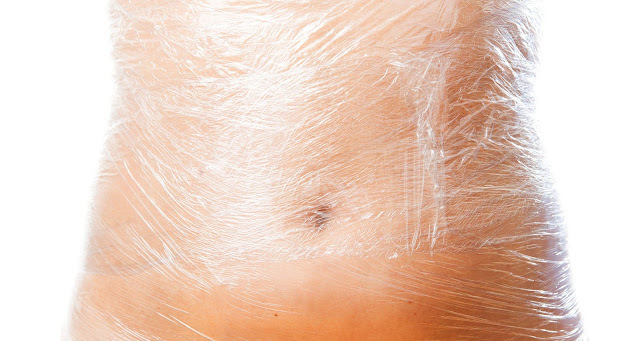 Is A Body Wrap Safe & Effective? A wrap is safe as long as it is done the right way and not left on for long. An ideal time to leave the body wrap on is 45 to 60 minutes. A wrap must also not be too tight, it should make you sweat but not suffocate you. Rather than chemical wraps done at spas, the best are the ones with all natural ingredients such as listed below. Keeping realistic goals is the key. Wraps can help you get rid of toxins and reduce inches quick, however, maintaining a healthy lifestyle including diet and exercise will pave way for long lasting results. Wraps will give you a fresh look, perhaps drop a dress size, but cannot give long lasting weight loss. It is also recommended if you want glowing skin for revealing dresses. Pregnant and breastfeeding women must steer away from any kind of body wraps. If you are constipated or menstruating, you shouldn't body wrap either. Any kind of medication to make you sweat or heating pads should be avoided as in this article we are informing of an all natural and harmless way. How To Do A Body Wrap At Home? 1. Exfoliation - The very first step of a DIY body wrap is exfoliation. Dry brush or scrub your body using any exfoliator or scrub to get rid of dull and dead skin. 2. Wrap - After exfoliation comes the part of wrapping up the areas. Apply your home-made mixture and wrap up the area. Make sure you don't wrap very tightly. It needs to be firm, but not that tight that you end up suffocating. 3. Sit back and relax - With the wrap on, you need to sit back and relax. Put on your headphones or watch your favourite TV series while the wrap makes your body sweat. This has to be done for at least an hour for best results. 4. Unwrap - After the one hour is up, gently and carefully start removing the wrap from your body. Take a bath with warm water to remove the excess gunk of the body wrap mixture, and softly massage the areas that had been wrapped. 5. Moisturise - Use a stretch mark or skin tightening cream or lotion, and generously apply that all over. You will see a visible difference in inches and will definitely feel great if the wrap has been done the right way. Take 2 tablespoons each of olive oil and Epsom salts and mix 1 tablespoon of coffee grounds and 3 teaspoons of ground cinnamon in it. Mix together, apply and cover with bandages soaked in warm water or plastic wrap. Seaweed wraps have been popular for ages. You can use fresh seaweed, if available, or seaweed powder, and mix it with some almond oil and rosemary oil. All the ingredients have their own special benefits and help in tightening the skin. Mix 3 tablespoons of organic cacao powder with 5 tablespoons of organic coconut oil and a tablespoon of sea salt. This helps in detoxing the skin while the properties of coconut oil include toning and moisturising. Mix together half a cup of fuller's earth or bentonite clay with 3 tablespoons of sea salt and a few drops of grapefruit essential oil. Mix this with warm green tea (use at least three teabags in a cup of water.) The tea shouldn't be boiling hot, but lukewarm. Wraps can be done weekly or as per requirement. They will never give long lasting weight loss but may help in permeating fat which helps shed inches. Never leave on wraps overnight and never wrap them too tightly. The natural ingredients are a much healthier option than chemical based products or off the rack wrap products. Maintain a healthy diet and exercise for effective reduction of fat.